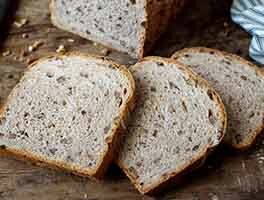 This hearty high-fiber, moist loaf features the delightfully nutty flavor of malted wheat. 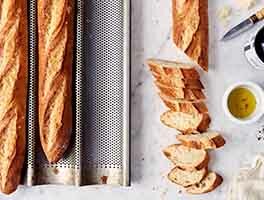 Mix and knead together all of the ingredients — by hand, mixer, or bread machine — until the dough is smooth and supple, 6 to 8 minutes. Transfer the dough to a lightly greased bowl, cover the bowl, and allow the dough to rise until puffy though not necessarily doubled in bulk, about 60 minutes. Preheat your oven to 350°F. Grease a 8 1/2" x 4 1/2" loaf pan and set it aside. Transfer the dough to a lightly oiled work surface, and shape it into an 8" log. Place the log in the prepared pan, cover the pan loosely with greased plastic wrap, and allow the bread to rise for about 1 hour, or until it's crowned about 1" above the edge of the pan. Bake the bread for about 40 minutes, tenting it lightly with aluminum foil after 20 minutes. Its interior will register 195°F on an instant-read thermometer when it's done. Store for 5 days well-wrapped at room temperature, or freeze for 3 months. Easy to make. Deep flavor that would seem to take much more effort. This recipe is definitely a keeper. I tried this since I have a bag of malted wheat flakes to use up. 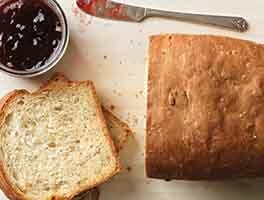 This bread was easy to make and turned out great. It rose really quickly, which doesn't normally happen in my cool kitchen, although I was using new yeast. The loaf baked up beautifully and I did not need to tent with foil. It sliced well for toast or sandwiches. I would definitely make this again. Simply delicious! This is a winner. I put all into a bread machine and baked it in machine. I made as written EXCEPT I substituted the 1/2 cup malted wheat flakes (did not have) for 1/2 cup of the KAF Harvest Grains Blend (whole oat berries, millet, rye flakes, and wheat flakes, flax, poppy, sesame, and sunflower). Will make again. I think these would be good as hamburger buns and dinner rolls as well. I love this recipe, I have made it twice now with perfect results. I subbed out organic coconut sugar for the brown sugar 1:1 ratio, and it even has more flavor depth without adding coconut taste. I use my Zo machine on the basic dough cycle to mix it and then do the second rise and baking outside of the bread machine. 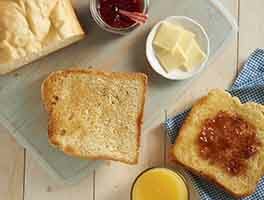 I am new to the taste of whole grain breads. I'm sort of easing myself in :) This bread is a fabulous introduction for a person like me. It has a mild enough flavor to pair with any sandwich filling you can imagine and a pleasantly chew texture from the flakes. It's been a repeat for me. Not a super-huge loaf, but packed with flavor. A nice change of pace from plain whole wheat bread. Delicious used for turkey sandwiches. This bread tasted great, but looks like a brick as it did not rise. I used my Z. bread machine and had it work while I was away. I was surprised to see how short it was as I've never had a problem with bread rising before. All the ingredients were fresh as well. I guess I'll have to try it again. I LOVE this bread! I cut the salt to 1 tsp and added a couple tablespoons vital wheat gluten. It's cool here, and it took about twice as long to rise, but it turned out great. The crust has a nice crunch, and the crumb is soft. SO glad I have 2 bags of malted wheat flakes!! 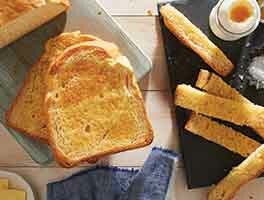 This bread has terrific flavor and texture. I did modify the recipe by substituting 2.25oz of Hi-Maize for the AP flour. I will definitely make it again. So easy!